Ugh, these are just too good. Waffles are just a danger food. I looooooove waffles, which is a bit weird because growing up they weren’t that special. Sure, I would gladly eat them doused in syrup AND powdered sugar whenever presented with the delicious opportunity, but they were never a breakfast I really craved. Chocolate chip pancakes on the other hand? Yes please, always. Waffles, though, are a new love of mine. Ever since I gave up traditional wheat-filled waffles they are all I think about every. single. weekend. I do my best to not make them (because let’s be honest, I would eat the whole batch), but sometimes I cave. In an effort to make them healthier, my right brain convinced my left brain that making savory waffles would be much healthier than making sweet waffles. It’s a fact. Also a fact, I love green chile anything. ANYTHING. Except maybe something weird like green chile donuts… which could actually be really good now that I’m thinking about them. So yes, green chile anything. I layered these poblano bites of heaven with sautéed chorizo, yolky eggs (cause, DUH), and cilantro. Healthy waffles never tasted so good (no sugar=healthy, my right brain is a genius). Pre-heat your oven to the broil setting, Line a sheet tray with foil and place peppers on tray. Place the tray under the broiler and broil about 5 minutes, or until the peppers begin to blacken. Rotate peppers about every 5 minutes until every side is blackened. Remove papers from oven, place in a bowl, cover with plastic wrap, and let sit about 15 minutes (this allows the peppers to steam so that the skins can be removed). Pre-heat the waffle maker. Meanwhile, in a large bowl, combine the almond flour, coconut flour, tapioca flour, garlic, baking soda, salt, and pepper. In a small mixing bowl, whisk together the eggs, melted oil, and coconut milk. Pour the wet mix into the dry mix and whisk until combined. Remove the roasted peppers from the bowl, and place on a cutting board. Cut the pepper tops off, and scrape away all the seeds and the skin. Dice up the peppers and add to the waffle batter, stirring to combine. Once the waffle maker is hot, brush a little cooking oil on both sides. Pour ¼ of the batter onto the bottom and spread it evenly on the four quadrants. Close the waffle maker and cook the waffles, either until it signals they are done or until the steam subsides. If the waffles look browned and release easily with a fork they are probably done. Repeat until the waffle batter is used up. 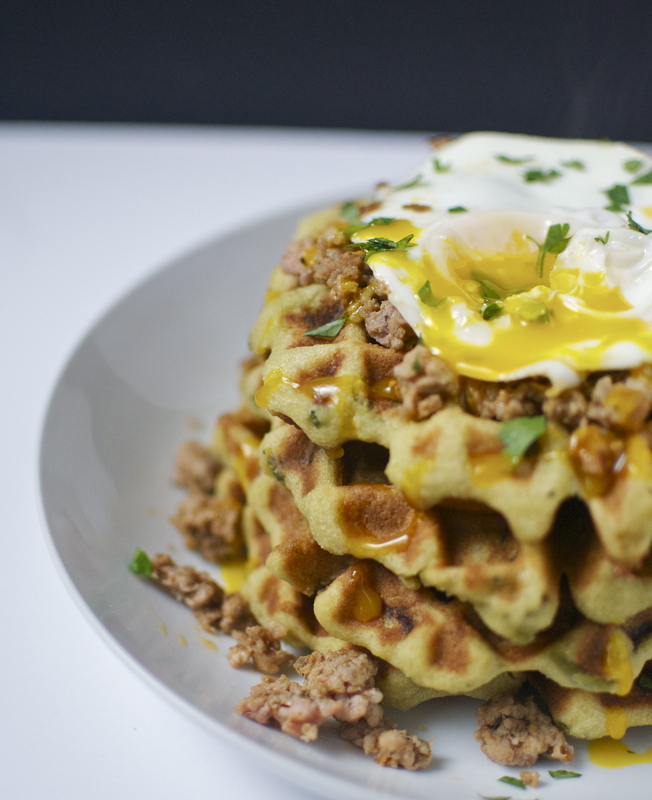 This recipe makes 4 good sized waffles. Top with browned chorizo, yolky eggs, or anything your heart (or stomach) desires. you are amazing, my dear! cannot wait to make these!!!!!!!!! 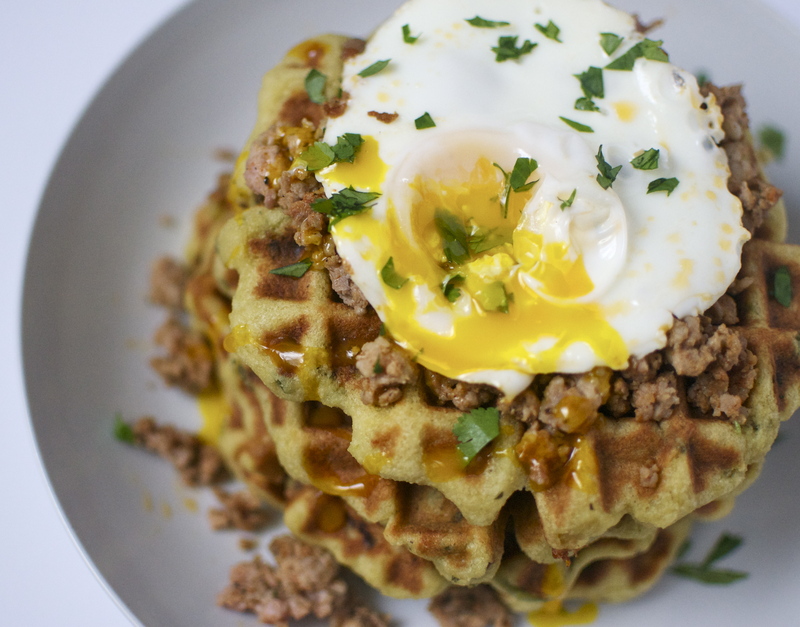 I’m doing a round-up of savory waffle recipes for Spoonful (Disney’s craft and cooking site) and wondered if I could include yours. I’d use one photo with credit and a link back to the full recipe. Would that be okay? Of course!! These are delicious, but my recipe for buffalo chicken waffles are even better!!! Thank you!